PAGES and the co-Future Earth Global Research Project AIMES (Analysis, Integration and Modeling of the Earth System) will conduct a joint workshop from 14-16 November 2018 in Hamburg, Germany. 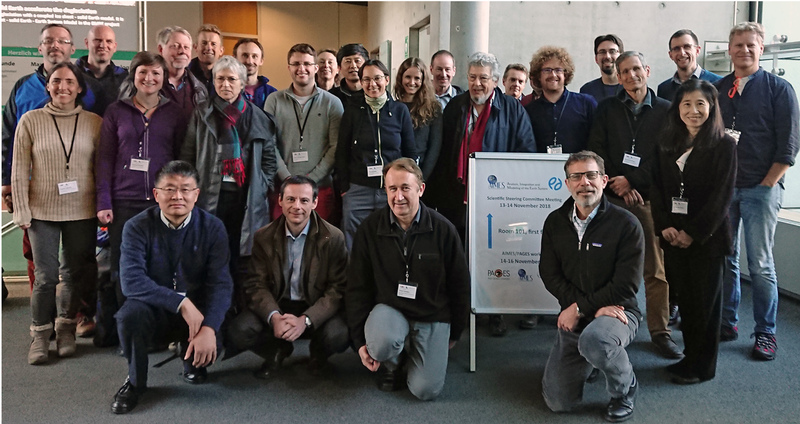 Members of PAGES' "Thresholds, tipping points and multiple equilibria in the Earth system" Integrative Activity have joined with AIMES to organize the "Abrupt changes, thresholds, and tipping points in Earth history and future implications" workshop. This meeting will be open to a small number of other participants currently not involved with PAGES Thresholds IA or AIMES. Overall, approximately 30 attendees are expected. 1. How to define, identify, and anticipate tipping points from paleoclimate records and models? 3. How can the paleo science influence our understanding of the tipping point problem? There is increasing realization and concern that human modification of the Earth system runs the risk of inducing abrupt transitions in climate, ocean circulation, the cryosphere, ecosystems, and society. Our ability to predict when and where such transitions, so called "tipping points", might happen is limited. While abrupt climate change has long been identified in ice core records (Dansgaard et al. 1993; Johnsen et al. 1992) and other archives, skillfully modeling abrupt change has largely been limited to simple models and many state of the art climate models underestimate the rate and extent of abrupt change apparent in paleo data (Valdes 2011). Major challenges facing more complex models include simplifying processes through parameterizations and the exclusion of processes important on longer timescales such as ice-sheet dynamics or carbon cycle feedbacks that would give rise to abrupt events. This challenges our ability to understand the ways in which human activities may put pressure on the biogeochemical and physical climate systems to induce tipping points in the future. Recently, a multi-model assessment revealed abrupt events in some models under forcing from the IPCC RCP scenarios, suggesting the possibility of predicting the likelihood of such events (Drijfhout et al. 2015). Advancing our understanding of the full range of possible abrupt climate change through the continued assessment and collection of paleoclimatic data and application of robust statistical techniques using improved multimodel experiments will help us to assess future risks. However, how to best use the paleoclimate record in this regard is not well established. The main objective of this workshop is to summarize and evaluate evidence on non-linear Earth system dynamics in recent geological history, and discuss how best to acquire, analyze and interpret such data to understand the risk of future abrupt transitions. Where applicable, we will discuss physical, biogeochemical, ecological and social processes that might have caused abrupt transitions to new states, and their relevance for Earth system models. We will assess the well archived and relatively abundant paleoclimate data from the Quaternary period, and the skill of the current state of the art climate models to reconstruct past abrupt changes and predict abrupt climate change in the future. To bring together experts in the mathematical modeling of tipping points and paleoclimate scientists with expertise in the following domains: cryosphere, atmosphere, carbon cycle, ocean circulation, ecosystems, and early societies. These scientists will be invited to synthesize paleo evidence, model-data comparison, and the ability of current generation of Earth System models used in the IPCC process to simulate abrupt changes and tipping points. The ultimate goal of the workshop is to produce a journal article summarizing both our understanding of the above issues and a roadmap for future progress in this area. Victor Brovkin (AIMES) and Ed Brook (PAGES) will lead the workshop and help organize the writing efforts that follow. The workshop will take place over three days, starting after lunch on Day 1 to allow for travel. Day 1 will be in plenary mode, with an introductory talk describing goals of the workshop and paper, an overview on the concept of tipping points, and several talks from experts on tipping points and related behavior in different aspects of the Earth system (cryosphere, atmosphere, ocean, carbon cycle, terrestrial ecosystems, marine ecosystems, social systems) as well as a synthesis discussion. The morning of Day 2 will be in breakout groups for discussion, initial synthesis and identification of future research objectives. Four groups are planned: physical climate system, ecosystems, biogeochemical cycles, and social systems. In the afternoon the groups will finish their summaries and report back in plenary session, followed by discussion and synthesis, including presentation of a suggested outline for the paper that will be produced by the group. Day 3 will start in breakout groups, with each group beginning the writing of sections of the paper, and return to plenary session prior to lunch for wrap up and a presentation about the IPCC Working Group I activities and how we can best contribute. In the afternoon of Day 3, time will be set aside to continue writing for those who can stay longer. Participants at the first Tipping Points Integrative Activity workshop, held in conjunction with AIMES, in Hamburg, Germany. Click to enlarge.